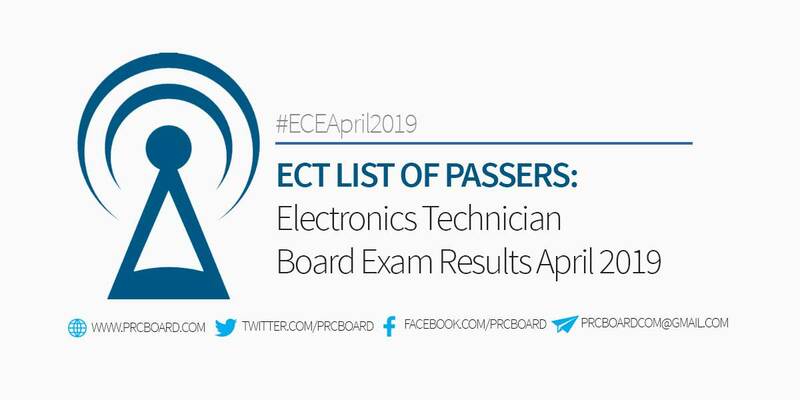 Manila, Philippines – The list of passers and full results of April 2019 Electronics Technician (ECT) Licensure Exam are released by the Professional Regulation Commission (PRC) Board of Electronics Engineering three (3) working days after the administration of exams. As announced, 1,365 out of 2,790 examinees passed the Electronics Engineering board exams while 1,473 out of 1,816 examinees successfully passed the Electronics Technician exams. The 2019 Electronics Technician licensure exams were conducted by PRC Board of Electronics Engineering headed by its Chairman, Engr. Alnar L. Detalla and its members, Engr. Enrico Claro R. Delmoro and Engr. Herminio J. Orbe. The first schedule of board exam for ECT was administered on April 5, 2019 at PRC testing centers in Manila, Baguio, Cagayan de Oro, Cebu, Cebu, Davao and Legazpi. PRC, in its official Resolution No. 1127 series of 2018 entitled "Schedule of Licensure Examination for Year 2019" said that the ECT result April 2019 will be posted on April 11, 2019 (Thursday) or three (3) working days after the last day of licensure examinations. Meanwhile, official results of ECT board exam may also be released earlier or later than the target date without prior notice. Electronics Technician or ECT board exam is one of the programs with average number of examinees conducted by PRC. In the most recent ECT board exams conducted last October 2018, 2,944 out of 3,605 examinees passed. Justine Allen Cayanan Arciga from Holy Angel University ranked first in the exams garnering a rating of 95.00% followed by Alvin Javellana Almencion from Technological University of the Philippines - Visayas, Cris Garpesa Bagotsay from Polytechnic University of the Philippines - Main Sta. Mesa and Kevin Lubrin Domingsil from Lyceum of the Philippines University Laguna, all having 90.30%. The complete list of top examinees are itemized here. In the top performing schools, PUP Sta. Mesa ranked first having 98.30% rating followed by University of Santo Tomas having an overall passing rate of 97.70%. Complete list of schools' performances here. To receive up-to-date news on ECT or Electronics Technician board exam results for April 2019, we advise our visitors to bookmark this page, visit PRC official website or follow us at our social media pages via Facebook and Twitter.